Hi! Thanks for stopping by to check the progress of Incendiary. I'm still proofreading it, but when I need to stop because my eyes aren't seeing the errors, I've been BLARING this song called BANQUET by BLOC PARTY and dancing around the house to it (with the blinds drawn because my dancing would frighten the neighbors into possibly calling 911). This song is so Brennus that it's scary--I just found it and it was instant love. As I proofread, I'm rewriting little sections as I go because I want to make the story as real as possible. I love the comments that you've been leaving (so awesome, I live for them, you have no idea how addicted I am to you--I'm becoming like Brennus about it: obsessed). I have been taking breaks to exercise, social network, and to fulfill family obligations, but I stopped doing anything that is just time-suckage, like watching T.V. (and I love me some T.V.). I can't wait! Super excited! I hope this next book isn't the last! I don't know what I'm gonna do when this series ends?! I hope you have more instore for us if this is to be the last book in the series!! I have read all three of the premonition series and love each one. I can't wait till Incendiary comes out. I read quite alot and have to say, you are a very talented writer. You bring your characters to life so well that I can picture each one in my mind. I especially love the Irish accent of Brennus and his family. I hope that Incendiary comes out soon. BEST ONE YET - Finished Indebted - after agonizingly trying to read slower...as if I could! Your stories are addicting, and heart pounding, and I loved every minute of it!!! Move over Dan Brown & Harper Lee... you are now my fav! I love your books! The story line is great, I was sucked in from day 1! I have fallen in love with the characters, all I can say is that I hope Brennus, Reed, and Evie get happy endings! Cant wait for the next one!! Cannot wait for the next one!!! Love everything about these books and will read everything u write- self published or not. When your good, your good (well in your case great, but u know what I mean;) and keep proof reading as quickly as possible please- but not too quick, it's good to be flawless. I have really enjoyed your books and am excited to see where it all goes! I really love Russell and root for him every time I read (I mean come on he's her SOUL mate)! If only he really existed :-) I hope that you have worked out a happy ending for Russell, it really bums me out to read about his rejection (I cant help but root for the underdog :-) Cant wait to to see whats in store! 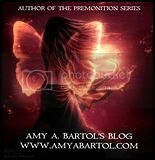 I am in love wit ye, Amy Bartol! Love your work! By far, the BEST series I have read in a long time and I have read a few. The lack of grammatical errors that exist in so many self published books is superbly refreshing (thank your mom for me!). I am not going to sleep until Incendiary comes out!!! I have to admit, although I love Reed (who doesn't?!) I was secretly rooting for Brennus all during Indebted. I think Russell is great, don't get me wrong, but I'm not sure what would happen to everyone if Evie actually ended up with her soul mate! Argh! So much to look forward to! Spreading the word about you like wildfire. I cant wait for the next book to come out!! I stayed up all night to finish indebted. The reed/brennus story line pulls me in everytime. I love reed but I love that brennus actually lets evie be herself and not coddle her all the time. Reed needs to take some pointers from him ;)..and my heart breaks for Russel over and over again. I'm very interested so see if there is a story line behind what reed said at the bar, about Russel betraying evie in their last life together. And I secretly hope Russel finds a female angel he can love like evie loves reed. Cant wait for another update!! I hope Russell ends up with Brownie! I love this series, and it is one of my all time favorite. I hope the series continues beyond the next book. I would love to hear what Amy thinks as well as everyone else. When will it be released?? Thank you so much for this series. You are a brilliant writer and a more brilliant storyteller! I am taken away from reality with every book! I've put parts of my life on hold bc I can't stop reading!!! That bloc party record is one of my faves of all time. So cool that it's inspiring you. I have to admit i was also secretly rooting for Brennus in this last book, because he was treating her so equal. Almost scared to read the next book but i am completely hooked :) You're an amazing writer. I just wanted to say that the song is soo Brennus! I cannot wait for the next book and I'm really intrigued about the self-publishing thing. (I might end up doing that myself.) I reread your books often, finding myself torn between Brennus and Reed, although definitely leaning towards Reed. Keep up the good work! ahhhh!!! so excited for Incendiary! i've been trying to distract myself with other books, but it just doesn't work because nothing compares to your work, Amy!! Soo overwhelmed with excitement! It's so creepy how this song is sooooo Brennus! Love it! Omg i love ur books!! Ur amazing! :-)) i VOTE SOUL MATE!! RUSSELL!! RUSSELL!!! He needs a good ending its not fair they had so many lifes together n mention it every time u got and torture RUSSELL every time its so sad :-( pls give him a good ending with evie...pls .. Reeds getting boring already lol hes hot tho cant deny that.. BRENNUS.RUSSELL.AND REED ARE SUCH BIG CHARATERS! ! I love them all but i vote for russell and evie all the way!! :-)).....he also got his own chapters thats got to mean something?.. I really really want Russel and Evie to get together I mean they are soul mates! Can you please give us a release date for incendiary? ? ?